L. Steven Platt, Esq., member of Robbins, Salomon & Patt, Ltd, has been recognized for demonstrating dedication, leadership and excellence in legal services. L. Steven Platt has 30 years of experience as an attorney, specializing in labor and employment discrimination law. 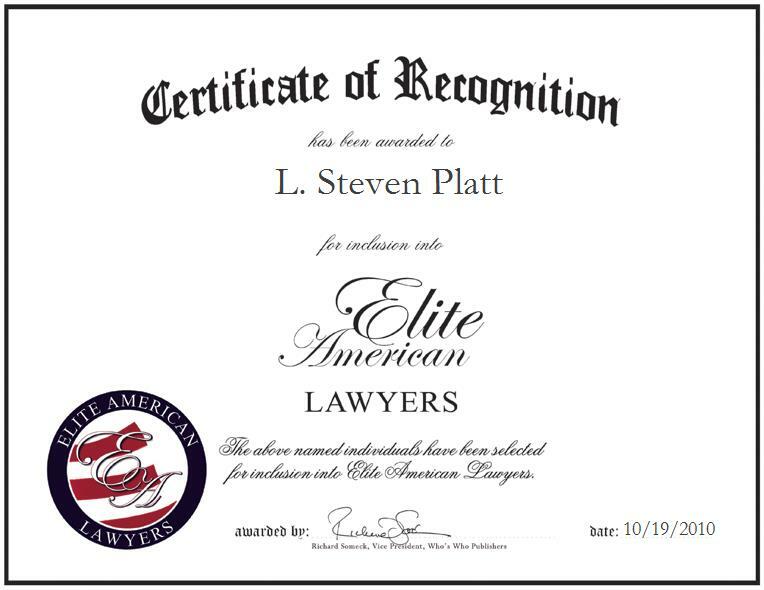 An expert litigator, Mr. Platt brings to his position not only extensive experience, but also a passion for helping those in need of legal representation. So determined is his work that he was selected as Crain’s Chicago Business’ “Super Lawyer of the Month” in January of 2009 and “Super Lawyer of the Month” in January of 2003. In 2008, Mr. Platt was chosen as the “Top Lawyer in Chicago” and he holds an AV Rating by Martindale-Hubbell. In 2009, Mr. Platt was also chosen as Cambridge Publishing’s Professional of the Year in Legal Services, recognized for his invaluable service in the field of law. Mr. Platt was selected as a fellow of the American College of Labor and Employment Lawyers through the American Bar Association. He is the former president of the National Employment Lawyers Association, an organization of 3,500 members. He holds a JD from Loyola University in Chicago and is a member of the Illinois State Bar Association.